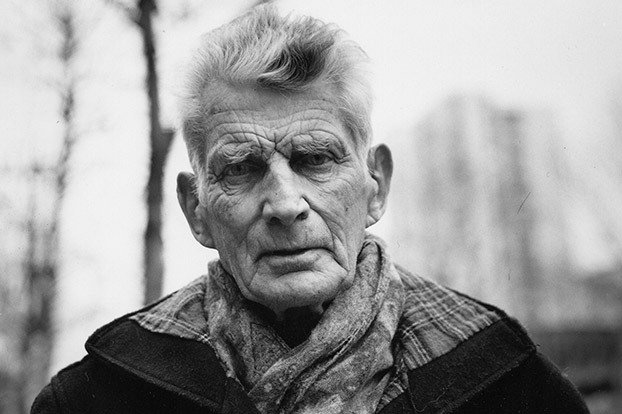 While Samuel Beckett is perhaps best known for Waiting for Godot, its companion piece, Endgame, cemented Beckett's place as the foremost playwright of his era. STC Artistic Director Andrew Upton recently described Beckett to the Daily Telegraph as "the most important writer of the 20th century", adding, "for theatre companies not to do Beckett would be a crime". So, what's all the fuss about? We've delved into some of the most frequently asked questions about Endgame to give you deeper insight and useful trivia about this play and the man who wrote it. At its simplest, Endgame is about four characters – Hamm, Clov, Nagg and Nell – waiting for the world to end. As Hugo Weaving put it, "Waiting for Godot is known as the 'play in which nothing happens twice'. In Endgame, nothing happens once." Hamm, a blind tyrant unable to stand, is measuring out his life to see what it all adds up to. His son, Clov, who is unable to sit, threatens to leave. And Hamm's parents, Nagg and Nell, live in bins, appearing intermittently. "Hamm is a king in this chess game lost from the start. From the start he knows he is making loud senseless moves. That he will make no progress at all with the gaff. Now at the last he makes a few senseless moves as only a bad player would. A good one would have given up long ago. He is only trying to delay the inevitable end. Each of his gestures is one of the last useless moves which put off the end. He is a bad player." IF NOTHING HAPPENS, WHY ALL THE FUSS? Endgame, like Waiting for Godot, has caused a lot of fuss. Like Godot, it was censored by the English government when it was first staged there, with words like 'arses' and 'balls' changed to more innocuous terms. The play's English-language premiere in London was delayed by months because the censors also claimed it was blasphemous. Like Godot, it initially received largely negative reviews but was eventually recognised as a classic and has entered the popular consciousness – even referenced in Sesame Street (Oscar the Grouch is based on Nagg and Nell). Samuel Beckett was a Nobel Prize-winning playwright, novelist and poet born in Ireland. Endgame was his second play for the stage, premiering in London (in French) in 1957. Discover more about Beckett. Hamm (Hugo Weaving). Much has been made of the name Hamm. Its homonym, ham, as in meat, could readily be garnished with the complementary spice clove (Clov). There is also a town in the Picardy region north of Paris called Ham, where some of the early drafts of Endgame were specifically set. The renowned Frankfurt School philosopher Theodor Adorno was convinced that the name derived from Hamlet, even after Beckett promised him it did not. Ham is also the name of Noah's second son, one of the eight people who survived the flood in the Book of Genesis, which Beckett was reading while writing the first drafts of Endgame. When directing a production of the play in Berlin, Beckett described the relationship between Hamm and the other characters as that between a hammer (Hamm) and three nails: in French, clou (Clov) means nail; in German, nagel (Nagg) means nail; with Nell deriving from the English. Edward Beckett (Samuel’s nephew and guardian of his estate) suggests that the name Hamm is derived from the name of a still-extant and well-known music and piano shop in Paris. "I'm convinced that Hamm just came to him, thinking about the music shop. Then the other nice connotations made the name more attractive to him." While drafting the play, Beckett titled it 'HAAM' – at some point, he changed not only the title but also the spelling. Clov (Tom Budge). Aside from the above readings of Clov’s name, some critics have argued that his name is an abbreviation of 'clown' (Theodor Adorno again) or of 'cloven' (as in the devil). Nagg (Bruce Spence) and Nell (Sarah Peirse). Beckett referred to the characters as les poubellards('the garbage binners') in letters. In early drafts of the text, in which Nagg and Nell do not appear, there was a coffin onstage from which a head would appear. In a letter to one of his lovers, Pamela Mitchell, Beckett desribed Nagg and Nell as a "moribund Darby & Joan amputated at the groin." To find out more, purchase a program at the theatre for $10. The Endgame program contains: essays on Samuel Beckett, his wife Suzanne, and his mentor James Joyce; a glossary of references; charcoal sketches by Archibald-winner Nicholas Harding; photography from the rehearsal room; and lots more. It's a magnificent way to extend and deepen your night at the theatre.